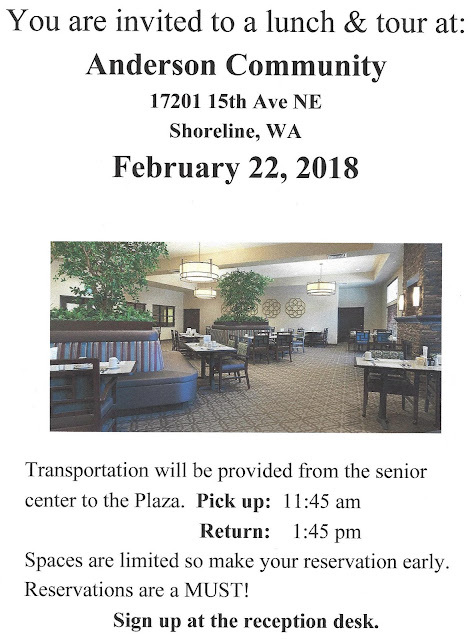 The Shoreline - Lake Forest Park Senior Center is facilitating tours of local Senior Living Facilities. Learn more about their services and living options before you are in a crisis situation. Each facility will provide transportation from the Shoreline-Lake Forest Park senior center to their site. All tours include lunch. We hope you, your family and friends will take advantage of this great opportunity to see what’s available for Seniors. Reservations are a MUST! Spaces are limited, so make your reservations early!